The inspiration for writing this book came as a result of talking with genuine sceptics of the Bible, and with others who had difficulty in reconciling their traditional Christian beliefs with their own experience and knowledge of history and science. It was clear that their understanding of the Bible had become mixed up with their knowledge of Christian traditions and church teaching, and when the latter of these was in error, the Bible was being held responsible. As a result, the Bible, and the Gospel within it, was not being taken seriously and was considered untrustworthy. In other words, inadequate Christian teaching and misleading tradition was eroding people’s trust in the Bible itself. and provides careful instruction and examples of how apparent difficulties can be resolved! Phil Layton in this useful book brings to us a timely reminder of the importance of the Bible for all Christians. Phil Layton is of the spiritual lineage of John Wesley, and he has proven it. He is committed to Scripture as the primary authority for Christian faith and practice. Captain Layton, devoted to God’s word and its veracity, will not rest easy when he finds contradiction in the Bible. And so Layton has settled upon an approach to the Bible that, first of all, assumes it is accurate, and any perceived error is due to our misunderstanding. This approach is explained well in the book. He teaches the reader to explore, to probe. He lists the types of things the reader must consider. And best of all, he goes the distance in pulling apart a problematic passage, as an example of how it should be done. 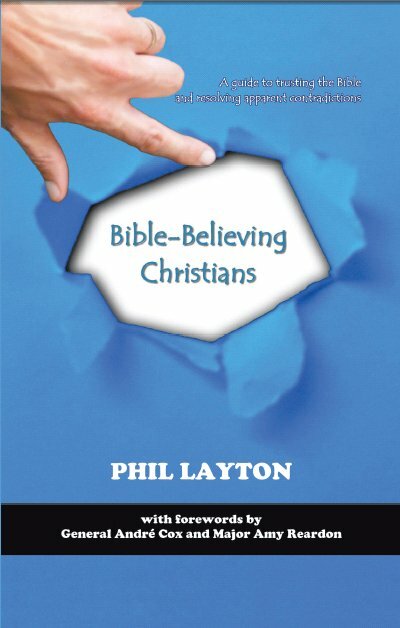 If you are troubled by the apparent contradictions in the Bible, Phil Layton's book may be what you have been looking for. Convinced of the accuracy of the Bible, he seeks to show how we need to ensure that we read the difficult texts in their context with great care and examine the issues more closely. He recognises that sometimes our preconceived ideas, or the accepted wisdom of others, or the traditional views of the church are the cause of what appears to be discrepancies. He gives examples and then shows the reader how to analyse and resolve such problems, adding that because one cannot always find the answer to the problem immediately, it doesn't mean that there isn't an answer. This is a book that every Bible student who has come across apparent contradictions would do well to read. ~ Free use of Bible-based worship song "We Believe"
who has also written a Bible guide on "The Rapture" as well as a fresh perspective on "The Sacraments and the Bible"
Phil has been a keen student of the Bible since his teenage years, with role models from within his family, many of whom are Christian ministers. As a result, his love of God, the Bible, and The Salvation Army has led to his ordination in 2000, when he was appointed with his wife, Karen, as corps officers (church pastors) to Swanage in Dorset, and then in 2003 to Hythe in Kent. Within this second appointment Phil also took on a 5-year dual appointment as a New Testament Tutor at William Booth College, London (2005-2010), as well as being a corresponding member of The Salvation Army’s International Doctrine Council (2006-2011), and also a member of the Moral and Social Issues Council in the United Kingdom (2005-2013). Phil finds greatest fulfilment when proclaiming the Gospel of Christ, and he has written two books which rely on the authority of Scripture texts alone, and which both highlight the importance of having a personal relationship with Jesus. and the second published in 2009 through International Headquarters, which deals with the relevance and detail found in the Christian eschatological theme of ‘The Rapture’. He has vocational qualifications in Management (L4) and in Information Technology (L3), while academic studies include a Bachelor of Arts degree (Religious Studies) from the University of Kent, and a Master of Theology degree from Heythrop College, University of London, in which he focused on uses and abuses of the Bible, ethics, and the Gospels. Phil and Karen have two children; Anastasia and Joshua, and to relax Phil simply enjoys being with his family, playing football, mountain climbing, cycling, swimming, or being on holiday where there is plenty of sun, sand, and sea!